I try to use this blog to write about things I love. Highlight the good in our little community of gamers. Show off awesome games and say great things about good people. But I can't do that this week. A couple of weeks ago, we passed the sixth anniversary of the funding Far West on Kickstarter. 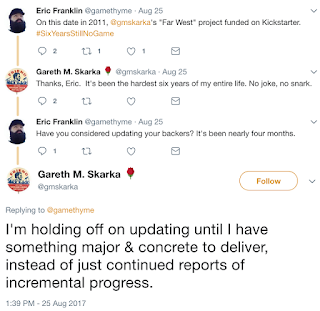 For those of you who aren't aware, Far West has become the poster child for poorly-run Kickstarter projects. Six years, no game. And the author/designer/publisher has given more than a few release dates, all of which have (obviously) been broken. I took this screencap from Tenkar's Tavern. 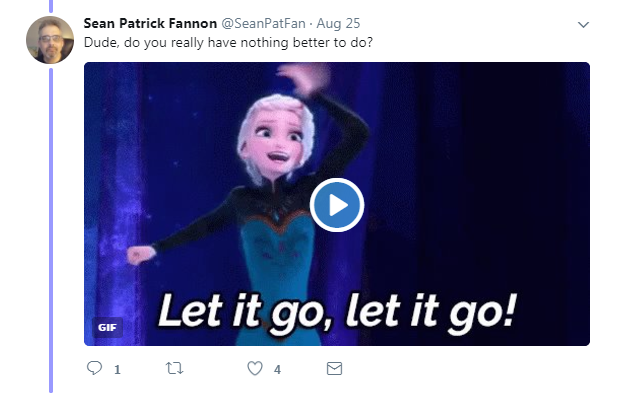 I couldn't grab it on my own, because Skarka blocked me on Twitter. Which is fine - that's his right. His Twitter, he decides what appears in his feed and what notifications he receives. If I cared enough to check, I could open Incognito Mode or Private Browsing or whatever and read his tweets that way. But - honestly - the only thing I care about from Skarka right now is Far West. And, even that, I don't care about that much. Brucato has never failed to treat his backers with respect. I'm sure he's had bad days, and I've a hunch he's bitched about us from time-to-time in private or to friends. And that's fine. But it's never spilled over into his comments or updates. If you ping Brucato by e-mail, he responds with an update (by e-mail). Yes, he needs to update the Kickstarter, but the fact that he is willing to fill us in is significant. If I were to ask Brucato for a refund, I would get it. I asked Skarka for a refund, and was turned down. I ended up going to my local attorney general, and managed to get a partial refund. Far West isn't the only project that has been delayed by its creator's illness, either. Lee Garvin, author of Tales from the Floating Vagabond spent some time in a coma. But he's kept his backers more-or-less updated and has kept his spirits up. And he's treated his backers with respect. So I guess I won't be buying Savage RIFTS after all. In fact, I'm a lot less likely to buy any Savage Worlds product because of this kind of attitude. See, I believe in getting what I've paid for. It's a quirk, I guess. Skarka will argue until the cows come home that we "backed a process, not a product." And he'll highlight that Kickstarter T&C have changed. And they have. They're less restrictive than they were. They used to required the project creator to complete their project and ship the promised goods. 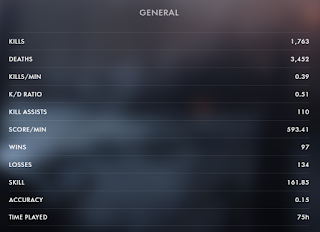 Now they only require that the project creator do their best and issue refunds if they can't complete the project. All projects must offer rewards. Kickstarter is not a general fundraising site, it’s a form of commerce and patronage. If you’re not viewing rewards as core to your project, Kickstarter may not be for you. Please note that raffles, discounts, coupons, financial returns, and investment offers are prohibited. That's right: According to Kickstarter themselves, this is a form of commerce and patronage. Commerce and patronage. Commerce, of course, is "the exchange of currency, goods, and/or services for other currency, goods, and/or services." Other definitions suggest that it's "the activity of buying and selling." 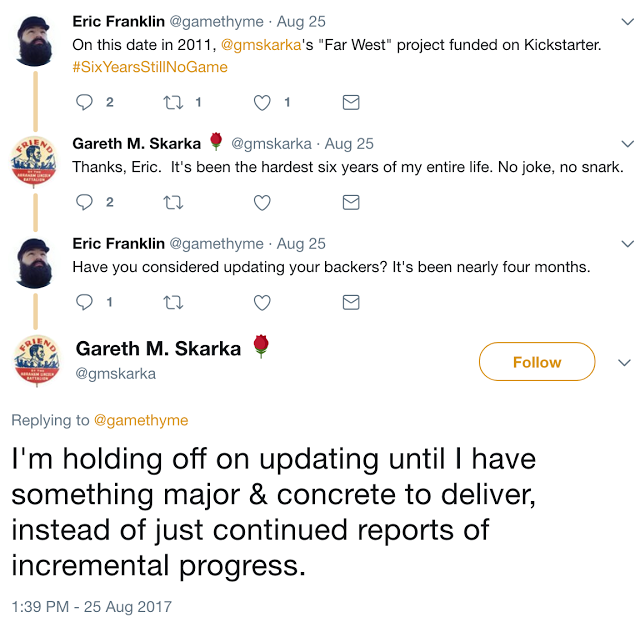 At present, Skarka's backers have given him currency and have received scorn, excuses, and arguments. And, of late, silence. "Powerful social forces" would suggest that Kickstarter believes that a project creator's peers would hold them accountable. But they're not. He's the only individual on the list. Ever. I won't buy Palladium Books product, but I won't single out any PB employees or freelancers and refuse to buy their work from other publishers. Update: my good friend James reminded me of a couple of individuals who are on the list that is forgotten about, so disregard this point. It's the only item on my list with a set end condition. Most of the companies on the list are there until they "change their anti-fan behavior," which is vague and subjective. "Until Far West is released" is oddly specific. Modiphius has stated publicly that they'll make it known which products he worked on, so I don't have to worry about buying a book and then finding out later that he'd worked on it, which is a relief. Had he treated his backers with respect or even given me a full refund when I requested it, I wouldn't be carrying this grudge now. I was a $75 backer. now I'm a $10 backer - but it's past the point of money for me. Now it's principle. I backed Far West because I was a fan of Skarka's work. Hong Kong Action Theatre! had some very interesting ideas about the intersection of character and role. UnderWorld was ahead of its time in a lot of ways. It was urban fantasy before urban fantasy was as explosively popular as it is now. But after this fiasco, I will never buy Adamant Entertainment product again. Or the product of any future publishing companies that Skarka creates when Adamant eventually fails. I'm only one person. I only have one wallet. And there's not a large crowd reading this - I have no illusions. I'm a small blog in a small corner of the internet. Honestly, my personal boycott is not likely to be noticed by Modiphius or Evil Hat or Cubicle 7. Well, noticed in their bottom line - it was (partially because of) my posting on Twitter that got Modiphius to disclose which products Skarka worked on.